Seyana is a leading quality specialist in handling and completing Plant Turnarounds & Shutdowns using ‘State of the art’ equipment based on latest technology concepts. 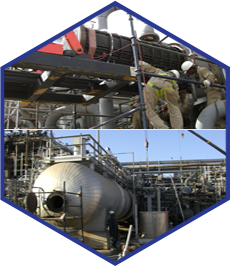 Backed up fully with the combined experienced work force of 4,500 of GCC with full supporting facilities and camps located in Abqaiq, Jubail and Dammam. Copyright © 2012 SEYANA - Maintenance & Industrial Services , All Rights Reserved.